For other uses, see Waltz (disambiguation). The waltz (from German Walzer [ˈvalt͡sɐ̯]) is a ballroom and folk dance, normally in triple (help·info) time, performed primarily in closed position. Describing life in Vienna (dated at either 1776 or 1786), Don Curzio wrote, "The people were dancing mad ... The ladies of Vienna are particularly celebrated for their grace and movements of waltzing of which they never tire." There is a waltz in the second act finale of the 1786 opera Una Cosa Rara by Martin y Soler. 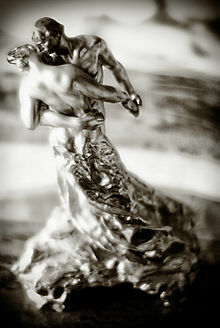 Soler's waltz was marked andante con moto, or "at a walking pace with motion", but the flow of the dance was sped-up in Vienna leading to the Geschwindwalzer, and the Galloppwalzer. Shocking many when it was first introduced, the waltz became fashionable in Vienna around the 1780s, spreading to many other countries in the years to follow. According to contemporary singer Michael Kelly, it reached England in 1791. During the Napoleonic Wars, infantry soldiers of the King's German Legion introduced the dance to the people of Bexhill, Sussex from 1804. It became fashionable in Britain during the Regency period, having been made respectable by the endorsement of Dorothea Lieven, wife of the Russian ambassador. Diarist Thomas Raikes later recounted that "No event ever produced so great a sensation in English society as the introduction of the waltz in 1813." In the same year, a sardonic tribute to the dance by Lord Byron was anonymously published (written the previous autumn). Influential dance master and author of instruction manuals, Thomas Wilson published A Description of the Correct Method of Waltzing in 1816. Almack's, the most exclusive club in London, permitted the waltz, though the entry in the Oxford English Dictionary shows that it was considered "riotous and indecent" as late as 1825. In The Tenant of Wildfell Hall, by Anne Brontë, in a scene set in 1827, the local vicar Reverend Milward tolerates quadrilles and country dances but intervenes decisively when a waltz is called for, declaring "No, no, I don't allow that! Come, it's time to be going home." The waltz, especially its closed position, became the example for the creation of many other ballroom dances. Subsequently, new types of waltz have developed, including many folk and several ballroom dances. 4 waltz, half and half). In the 1910s, a form called the "Hesitation Waltz" was introduced by Vernon and Irene Castle. It incorporated "hesitations" and was danced to fast music. A hesitation is basically a halt on the standing foot during the full waltz bar, with the moving foot suspended in the air or slowly dragged. Similar figures (Hesitation Change, Drag Hesitation, and Cross Hesitation) are incorporated in the International Standard Waltz Syllabus. In California the waltz was banned by Mission priests until after 1834 because of the "closed" dance position. Thereafter a Spanish Waltz was danced. This Spanish Waltz was a combination of dancing around the room in closed position, and a "formation" dance of two couples facing each other and performing a sequence of steps. "Valse a Trois Temps" was the "earliest" waltz step, and the Rye Waltz was favoured as a couple dance. In contemporary ballroom dance, the fast versions of the waltz are called Viennese Waltz as opposed to the Slow waltz. In traditional Irish music, the waltz was taught by travelling dancing masters to those who could afford their lessons during the 19th century. By the end of that century, the dance spread to the middle and lower classes of Irish society and traditional triple-tune tunes and songs were altered to fit the waltz rhythm. During the 20th century, the waltz found a distinctively Irish playing style in the hands of Céilidh musicians at dances. The Peruvian Waltz is called and recognised in Peru as vals criollo. The Mexican Waltz (vals mexicano) follows the same basic rhythmic pattern as the standard waltz, but the melodies reflect a strong Spanish influence. Mexico's Juventino Rosas wrote "Sobre las Olas" or "Over the Waves", commonly known in the U.S. as a circus song played during a trapeze show. The Cajun Waltz is danced progressively around the floor, and is characterised by the subtle swaying of the hips and step very close to ordinary walking. It is danced entirely in the closed position. 4 are found. In modern bal folk, waltzes in even higher metres are played and danced. Today both the faster Viennese Waltz, made forever popular by the Strauss family, and the slower American and International style waltzes are extremely popular with dancers of all ages. Sama'i (also known as usul semai) is a vocal piece of Ottoman Turkish music composed in 6/8 metres. This form and metre (usul in Turkish) is often confused with the completely different Saz Semaisi, an instrumental form consisting of three to four sections, in 10/8 metre, or usul aksak semai (broken semai in Turkish). Semai is one of the most important forms in Ottoman Turkish Sufi music. The Tsamikos (Greek: Τσάμικος, Tsamikos) or Kleftikos (Greek: Κλέφτικος) is a popular traditional folk dance of Greece, done to music of 3/4 metre. Man and woman dancing a waltz by Eadweard Muybridge. 1887. ^ The History of Lady Sophia Sternheim, trans. Christa Baguss Britt (State University of New York Press, 1991), p. 160. ^ a b Jacob, H.E. (2005). Johann Strauss: Father and Son a Century of Light Music. pp. 24–25. ISBN 1-4179-9311-1. ^ Gutman, Robert W. (1999). Mozart: A Cultural Biography. Harcourt. pp. 44–45. ^ Hilton, Boyd (2006). A Mad, Bad, and Dangerous People? England 1783–1846. Oxford University Press. ^ Raikes, Thomas (1856). A Portion of the Journal Kept by Thomas Raikes from 1831 to 1847: Comprising Reminiscences of Social and Political Life in London and Paris During that Period. pp. 240–243. Retrieved 20 September 2015. ^ "Introduction to 'The Waltz'". Readbookonline.net. Retrieved 20 September 2015. ^ Childers, William (1969). "Byron's "Waltz": The Germans and Their Georges". Keats-Shelley Journal. Keats-Shelley Association of America, Inc. 18: 81–95. JSTOR 30212687. ^ Fullerton, Susannah (2012). A dance with Jane Austen: how a novelist and her characters went to the ball (1st Frances Lincoln ed.). London, England: Frances Lincoln Ltd. pp. 110–111. ISBN 978-0-7112-3245-7. ^ a b Blatter, Alfred (2007). Revisiting music theory: a guide to the practice. p. 28. ISBN 0-415-97440-2. ^ "The History of Ballroom Dance in America". Archived from the original on 2011-03-06. Retrieved 2010-12-13. ^ Shaw, Lloyd (1939). Cowboy Dances. The Caxton Printers. pp. 101–103. ^ a b Czarnoski, Lucile K (1950). Dances of Early California Days. Pacific Books. p. 44. ^ Czarnoski, Lucile K (1950). Dances of Early California Days. Pacific Books. p. 121. ^ "Information on Styles of Waltz include American, International, C&W, Viennese Waltz and others!". Dancetime.com. 2012-09-09. Retrieved 2017-10-02. ^ Vallely, F. (1999). The Companion to Traditional Irish Music. New York: New York University Press. pp. 431–433. ^ "Rhythm Definitions - Irish Traditional Music Tune Index". Irishtune.info. 2012-07-11. Retrieved 2012-11-07. ^ "The Whirling Dervishes". Retrieved 30 December 2016. ^ "AllMusic Review by James Manheim". Retrieved 30 December 2016. ^ "yamahamusicsoft". Archived from the original on 1 January 2017. Retrieved 1 January 2017. Wikimedia Commons has media related to Waltz.